Sparsh Resort v Manali, Indie: Zarezervujte nyní! 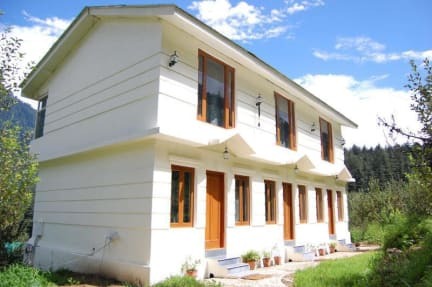 Sparsh Resort is a limited first class guest house located only 5 minutes from Manali bus station in the best area of Manali, Loghuts area, and within walking distance of the Old Manali and ancient Hadimba Temple. 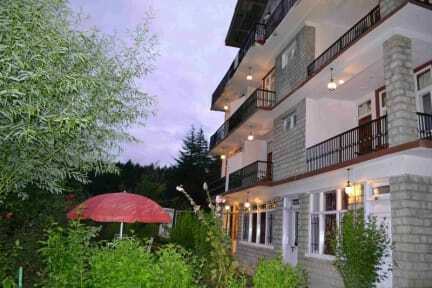 Resort is a combination of spectacular neat and clean rooms and cottages/villas. Situauted at Loghuts area, close to Old Manali street. Living room is equipped with spacious and beautiful washroom, a bar table, sitting area with sofa arrangement, LCD Tv with satellite program, electric kettle,and other services like personally appointed cook, travel guide, bonfire arrangement, etc. Master bedroom has king size bed, private balcony with panoramic view of snow and valley, a large washroom with 24hrs running hot n cold water, Rain shower, etc. All Rooms are wall to wall carpeted/with wooden flooring with attached baths, very spacious rooms with neat and clean bathrooms, 24hrs hot and cold water available. color television with active cable connection, rooms service, spacious balcony or spectacular view from rooms, you enjoy panoramic view of snowcapped mountains, natural waterfalls, apple orchard and valley view. All the homes are outfitted with the latest amenities to ensure that your stay is as relaxing and satisfying as possible. Everyone feels like home in this lovely guesthouse at very affordable place.